Well, it's finally happened. President Trump has written about a Minnesota company on Twitter. 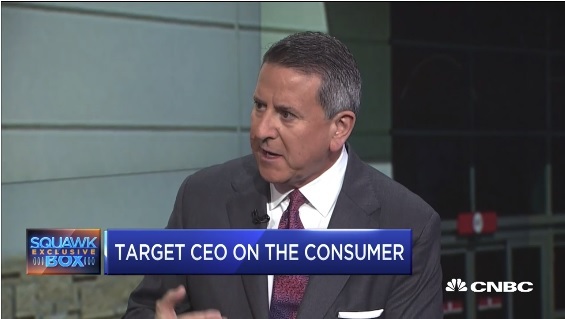 CNBC's morning "Squawk Box" show latched onto Trump's tweet and replayed comments that Target CEO Brian Cornell made on the program two days ago, the morning the company announced second-quarter results that showed the biggest jump in same-store sales in a decade. The quarter was the best since Cornell arrived as CEO four years ago. "I think this is the healthiest environment I've ever seen," Cornell said on CNBC. "But importantly for us, we are building market share in virtually every category." Trump's tweet referred to the Drudge Report, which may have had a link to the CNBC report or another about Target's performance. The site had no links about Target by mid-morning Friday, however. On the conference call that Target executives held with investors and analysts to discuss the quarterly results Wednesday, Cornell said the company was "benefiting from a very strong consumer environment, perhaps the strongest I've seen in my career." But his statement was more expansive and nuanced and exhibited some caution about the president's trade policies. "There's no doubt that, like others, we're currently benefiting from a very strong consumer environment, perhaps the strongest I've seen in my career. But market share data demonstrates that our current results are benefiting from more than just the environment as we're seeing broad market share gains across categories we sell. The question we continue to hear from many of you is whether we can separately measure the benefit of each of these investments we're making, and the honest answer is we can't evaluate each one of them in isolation. Instead, it's the collective benefit of all these initiatives that is keeping Target more top of mind with guests, enticing them to visit our stores and our site more often. "Before I turn to our outlook for the rest of the year and beyond, let me comment briefly on the topic of tariffs. Like many of you, we've been carefully monitoring recent tariff announcements, and we're aware of the potential for this situation to further escalate. As we've said many times, as a guest-focused retailer, we're concerned about tariffs because they would increase prices on everyday products for American families. In addition, a prolonged deterioration in global trade relationships could damage economic growth and vitality in the United States. "Given these risks, we've been expressing our concerns to our leaders in Washington, both on our own and along with other retailers and trade association partners. However, our concern is centered on the impact of tariffs on consumers and the economy, not our ability to manage our business in the face of these challenges. As you know, when we're faced with tariffs or any other external factors, there are multiple levers we can pull to remain price competitive and maintain profitability, and we are continually developing and implementing contingency plans as we learn more and things evolve." Do MN-based small businesses have an edge over national ones when applying at the MN State Fair?